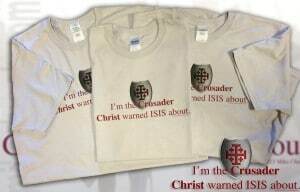 The WORLD FAMOUS I’m The Crusader T-shirt is starting conversations and garnering stares everywhere folks are wearing it. Order 3 today and your shipping is FREE! Mandeville, LA – Exclusive Transcript – “Westermann, in command of the blues pursuing them westwards back into Brittany, ordered no quarter to be given. ‘The road to Laval is strewn with corpses’, reported one of his men, ‘Women, priests, monks, children, all have been put to death. I have spared nobody.’ Perhaps 10,000 died during this retreat. On 23 December, finally, the remnant of the Catholic and royal army turned to face its pursuers at Savenay. Only 4,000 or 5,000 were left in any state to fight, although twice that number were crammed into the little town. Two-thirds of them were destroyed in the battle and mass shootings which followed. [Mike: He means mass executions.] The ‘Great War of the Vendée’ was over, but republican vengeance was not.”. Check out today’s transcript AND CLIP OF THE DAY for the rest…. Mike: I don’t wish, I would prefer that the United States had no nuclear devices. I would also prefer that the Soviets, the Russians had none, and anyone else that has any. The logical fallacy that is mutually assured destruction is just that. There’s nothing just in it. Yet this has been promoted, [mocking] “Well, you have to have these things so you can deter.” So you can deter what? [mocking] “So we can deter genocides.” Well, the Nazis didn’t have a nuke. I seem to recall there was a genocide there. There was the murder of millions of people. As I pointed out to the gentleman yesterday, the French in 1792, ’93 and ’94 didn’t have any nuclear incendiary weapons, yet they managed to slaughter one-quarter of a million Catholics in the Vendée. I asked a question yesterday of someone who was writing me about this. I said: Answer the following query. Why did we allow the French to get a nuke? I just demonstrated to you that even without a nuclear device, the French people are capable of massive genocide. Genocide, that’s what it is. That’s what was visited upon the Vendée. They didn’t need a nuke to do that. Historians still don’t want to discuss this and they don’t want anyone to start investigating this. They don’t want anyone to make any movies or anything about this. If it is ever revealed what the French people did to the Vendée, then the reputation of France as some sort of a paradise for hippies and peaceniks will go out the proverbial window. That’s not to say that the French of today are the same as they were during the Great Terror. I would suggest that many of the French today are probably worse. They’ve been completely divorced now from any atonement in the afterlife or any atonement through eternity for any of their sins.